People visiting Cannon County will now see an attractive decoration as they enter from the west or leave from the east. Cannon County Commissioner Kevin Mooneyham hung a Barn Quilt on the front of the barn next door to the Cannon County Animal Clinic Monday morning. 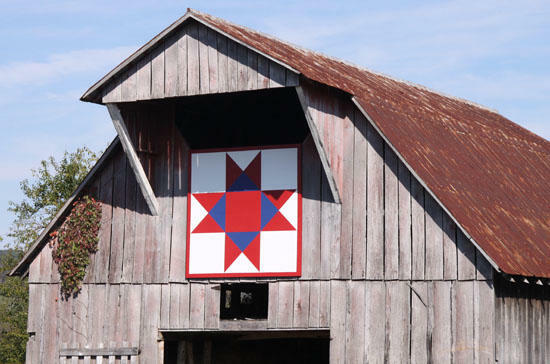 Mooneyham said he and his wife, Diane, got the idea after seeing quilts on other barns throughout the region as part of the Appalachian Quilt Trail. They hope the Barn Quilt will help promote agritourism in Cannon County. The barn is owned by Christine Dillon, and the Mooneyhams thanked her for allowing it to be used to hang the quilt. The also thanked Ronald Paschal for the use of is backhoe to lift the quilt for placement. Commissioner Mooneyham said the materials for the quilt cost about $400, and were purchased locally. The Mooneyhams are hoping other area residents with barns will consider place a quilt on theirs to promote agritourism. More information about the Appalachian Quilt Trail can be found at http://www.vacationaqt.com/. UPDATE: The Mooneyhams reported on Thursday (Oct. 20) that the local quilt had been added to the Appalachian Quilt Trail. This is such a beautiful idea, if some of you are like me, you will get on the computer to see what that design of quilt it called. My mother did a lot of quilting when I was growing up and I have forgotten a lot of the designs she made. This one is beautiful.We have a 13 year old barn on our property I would like to have one put on our barn, that is a great idea. Thanks to the Mooneyhams! Thank you very much. We are glad you like it. That Quilt Block is called an Ohio Star. I saw this yesterday, and as a lover of quilts, I thought it was very beautiful! Great idea!